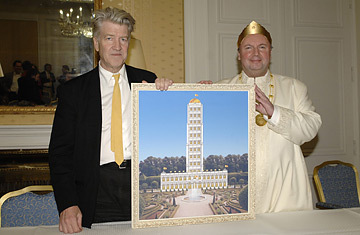 Director David Lynch and Emanuel Schiffgens display a plan for a transcendental university. David Lynch is no stranger to weird confluences. But the U.S. filmmaker, known for such works as Blue Velvet and Twin Peaks, failed to anticipate the reception his latest project got in Germany this week. Lynch, whose new-age beliefs are sometimes as quirky as his movies, is touring Europe to help establish a network of so-called "invincible universities" to teach the philosophy of transcendental meditation. The idea is to engender world peace. But at a meeting this week at a culture center in Berlin, Lynch triggered a less than peaceful exchange with German onlookers when Emanuel Schiffgens, his partner for establishing such a "university" in the German capital, suddenly veered into dangerous waters. "We want an invincible Germany!" intoned Schiffgens, the self-styled Raja of Germany. The flap those words created, with their echoes of the Third Reich, reveals both the deadly seriousness with which Germans view their wartime past and the gulf separating Lynch's new-age agenda from that of some hard-bitten Berliners with a more historical mind-set. "What do you mean by this concept of invincibility," asked an onlooker from the audience, made up mainly of film students with a smattering of meditation devotees. "An invincible Germany is a Germany that's invincible," replied a Delphic Schiffgens, who was dressed in a long white robe and gold crown. "Adolf Hitler wanted that too!," shouted out one man. "Yes," countered Schiffgens. "But unfortunately he didn't succeed." At that the crowd began shouting epithets at the speaker: "You are a charlatan! This is bad theater!" Lynch, who does not speak German, looked on in incomprehension. The director was in Berlin attempting to buy a large swath of land on a hill known as Teufelsberg, or "Devil's Mountain," on the city's outskirts. The hill is made up of some 12 million cubic meters of rubble cleared away after Berlin was destroyed in World War II; the site was later used as a U.S. listening post during the Cold War. Lynch and Schiffgens are followers of the Maharishi Mahesh Yogi, who founded the concept of transcendental meditation. Schiffgens says that with Lynch's help he plans to build a gleaming new "university" on Teufelsberg in order to provide "knowledge to students but also give them the chance to be enlightened." The university would form part of a network of similar institutions in Austria, France and elsewhere. Shortly after Lynch laid a foundation stone this week, however, a senior official in the regional government told German radio that it had not granted permission for construction of the university on Teufelsberg and possibly never would. A manager at the Berlin culture center where Lynch and Schiffgens spoke conceded that the flap did not reflect well on his center. "It's all a bit embarrassing," he said. Near the end of the meeting, Schiffgens tried to explain his use of language to a restive crowd: "Invincible means no more negativity. No more enmity. We want to make Germany invincible so they cannot defeat you!" Lynch, who by this time had availed himself of a translator, then stood up and took the microphone: "You all have a history and Raja Emanuel has triggered some things. I would say, 'Deal with it.' Have it out with Raja Emanuel. But he's a great human being." The American director, a bit of a cult figure himself in Europe, regretted that the real message of transcendental meditation, which he calls an "ancient eternal knowledge verified by Western science," was being lost in the furor. "Mankind was not made to suffer," he said. "We are all one. Bliss is our nature ... But somehow tonight this beautiful gift has gotten perverted. Let's march boldly toward a bright and shining future!" The strangeness of the whole affair was not lost on film students in the audience, one of whom caught it on film . At the very least, the evening was suitably Lynchian: disturbing but good theater nonetheless.